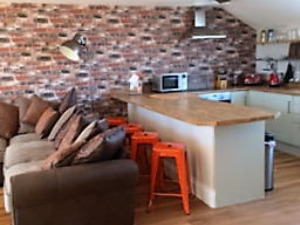 Apartment 15 Luxury Loft Self-cateringLuxury modern holiday apartment in the heart of York just 10 minutes walk from city centre restaurants, shops and attractions. Modern, self catering, 3 bedroom duplex loft in the heart of the city of York. Fully equipped kitchen with open plan dining and family room. Sleeps 6 comfortably. Full Sky Sports and Movies package. Children welcome from any age. Apartment 15 Luxury Loft offers weekly bookings starting on any day and sometimes short breaks. The accommodation at Apartment 15 is ideal for couples, families and small groups sleeping 6 adults comfortably. For families with children a double pull out bed is available at a small extra charge to extend the sleeping arrangements. For bookings within 30 days full payment is required at time of booking. Apartment 15 offers weekly bookings starting on any day and sometimes short breaks. The apartment is located close to city walls at Fishergate Bar and the barbican Theatre. Use postcode YO10 4AW for satnav. I've marked staff service for this because the owners went above & beyond to help us with this booking and with setting up a surprise for the birthday girl in our group - thank you again. The apartment is lovely and spacious - 6 of us fit really well, not under each other's feet. The bedrooms are all a good size - 2 twins on the upper floor and a double en-suite on the main floor as well as the main bathroom. The kitchen & seating area are great - massive sofa and some chairs for us all to lounge around on and a lovely little balcony with tables & chairs outside - unfortunately not the weather for us to enjoy this but great on a summer night. The kitchen had everything we needed too - lots of lovely touches like coffee & milk sachets to keep you going until you do a shop. We walked into the centre in the morning - along the river as suggested by the owners - which took around 10-15 mins. The walk back through the road way was around the same and easy too. Nighttime we got a minibus in to our restaurant- £9 between us and 4 of us got an Uber back at around 0230 for £4 so not expensive at all and was around a 6 minute journey. I would stay here again without hesitation and I would book directly through the owners - our original booking was made via a website but we needed to alter our length of stay and the website wouldn't let me change it so I rang to talk to them - ended up cancelling that booking and rebooking direct, receiving a discount for doing so. The owners also helped sort out a workable check out time for us too. Although we didn't use it - we were in a minibus there and back - there is private parking for the apartment just behind it under the archway.